Lots of debates and discussions are taking place all around the world regarding the similarities and differences between ‘sports drinks’ and ‘energy drinks’. Infact some people have the notion that both these drinks are same; but in reality they are quite different from one another. The European Specialist Sports Nutrition Alliance (ESSNA) emphasizes that both the drinks should be differentiated. This question came in strongly after the hearings by UK House of Commons Science and Technology Select Committee’s oral evidence session. The session was regarding the effects on health of children and young people, who took energy drinks. Basically in the whole discussion, there were confusions as what are exactly are energy drinks and sports drinks. ESSNA aims at correcting the various misconceptions that are there regarding the issue so that people can use the right drinks as per their needs. In energy drinks, there are high contents of caffeine and similar stimulants and these are not suitable for designed for athletes and sportspersons in any manner. On the other hand, sports drinks are specifically designed for athletes and sportspersons and do not contain caffeine and similar stimulants. Since energy drinks are usually high on the caffeine content, they might lead to potential health hazards particularly in adolescents and children. It has been seen that this might be a leading cause of alcohol consumption. In many countries, there are restrictions on energy drinks – it cannot be sold to anyone, who is under the age of 16 years. If you really want to know the exact difference between energy drinks and sports drinks, you have to understand each drink in detail. To put in simple terms, sports drinks are consumed when a person undergoes rigorous activities or sweats it out at the gym. The main components present in sports drink include salt, sugar and various kinds of vitamins. After a gym or training session or after some kind of heavy, rigorous work, one sweats and this leads to loss of salts and nutrients from the body. Sports drinks play an active role in replacing the lost electrolytes in the body successfully. Energy drinks on the other hand are a kind of beverage, the main components of which are some kinds of stimulant drugs. Caffeine is the most common thing present in almost all energy drinks; only the percentages might vary from one drink to another. As is evident from the name of the drink, it helps in providing extra boost and energy to individuals for being able to keep going. Both physical and mental stimulation is expected from these drinks. These products are mainly targeted at young adults including students, who need those extra doses of energy for their activities. 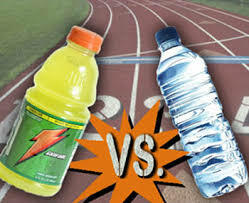 There are three major categories in which sports drinks can be divided. These are isotonic, hypertonic and hypotonic drinks. In isotonic sports drinks, the concentration of salt and sugar is the same as it is there in the human body. In hypertonic sports drinks, the concentration of sugar and salt is on a slightly higher level when compared to that of the human body. Last, but not the least are hypotonic sports drinks, in which the salt and sugar concentrations are lower than that of the human body. Majority of the sports drinks are moderately isotonic or between the range of isotonic and hypertonic. Caffeine is the steady component in all energy drinks. Both physical and mental stimulation can be obtained with these drinks. The two main categories of energy drinks include carbonated and un-carbonated drinks. Other stimulants along with caffeine are present in these energy drinks in considerable amounts. These also contain significant quantities of artificial sweeteners and sugars as well as herbal extracts and amino acids. This extra caffeine and sugars in the energy drinks are not needed by the body for proper functioning and as a result, they cause harmful side effects. Obesity is the leading health disorder of taking excessive energy drinks along with other things like irritability, anxiety, agitation and insomnia. Before making and marketing the products, the company should provide clear guidelines as who should use the item and who should not. But before that educating ourselves is important regarding sports drinks and energy drinks.